Thanks in part to a Facebook group called “Star Trek Shitposting,” I have been diving in up to my sternum lately into the universe known as Star Trek. I recently watched all seven seasons of the Voyager series, for example, an endeavor that was well worth the time. While the series starts off on shaky legs, once Kes is absorbed into the cosmos and Seven of Nine is rescued, it seems to find its footing, and, occasionally, its writers present you with something masterful. There is, for instance, the episode called “11:59,” the 23rd episode of the fifth season. This episode leaves behind the nuts and bolts of space and science fiction and entertains some of Kathryn Janeway’s genealogy–an ancestor of hers named Shannon O’Donnel and her involvement in something called the “millennium gate” project. I am not sure many Trek fans would choose this as one of their favorite Voyager episodes, but it is one of my standouts, as the writers had the courage to leave the starship behind and to tell a plainer tale set in the 21st century somewhere in Indiana. 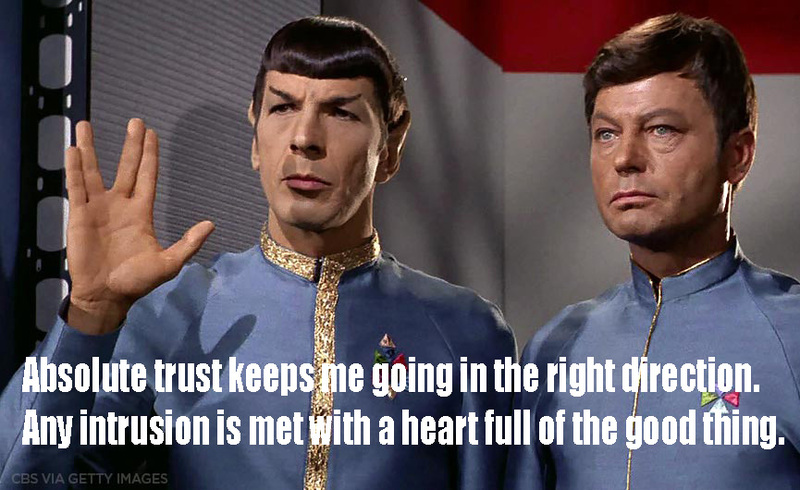 It is a striking love story and a somewhat bittersweet entry into this Trek franchise. It is a true surprise, and a welcome one. There is “Blink of an Eye,” season six, episode 12, in which Voyager becomes trapped in a magnetic field that forces them into a temporal orbit so that their passage of time differs wildly from that of the inhabitants on the planet’s surface. While a few hours pass for Voyager’s crew, eons of time pass for the planet’s inhabitants, as they move from their iron age through to space travel. Such a boldly large scope for storytelling. In the same vein, what about the spore drive itself? This supposedly is the most speedy and most accurate way to travel in space. Why is it not present in TOS, which is supposed to take place after Disco? Is it perhaps too unsustainable? The bottom line is that if you’re going to watch Discovery, you’re just going to have to let some of these things go. And, yes, that means Ethan Speck as Spock, too. 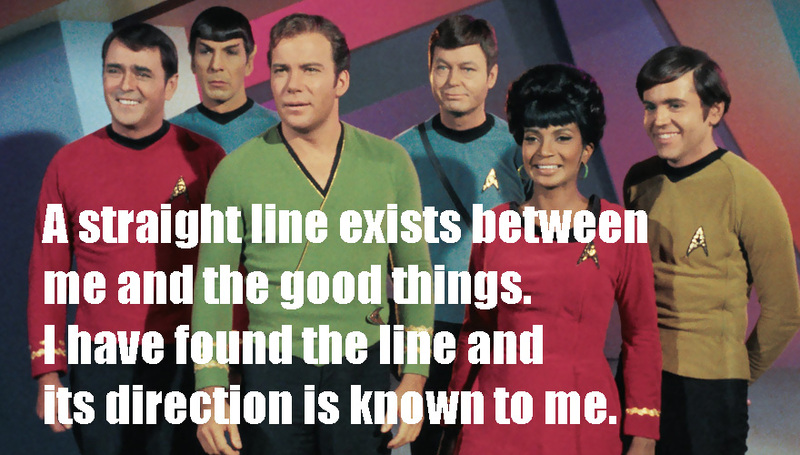 I think the writers understand an essential aspect of Trek in general. I remember watching the show on the television when I was a child. I think I was at my friend’s house, where I think was the first time I had ever witnessed this thing known as “color television.” I remember finding the show to be generally dull until the appearance of the Vulcan character. This is a character that scruffs the imagination, this lanky fellow with the odd haircut, the eyebrows, and the pointy ears. This is a character with one lonesome backstory, half-Vulcan, half-human, an outcast at any entrance, yet still an alien with superpowers–super-strength, able to disable another with a single touch, able to crawl into a person’s headspace and rummage around. 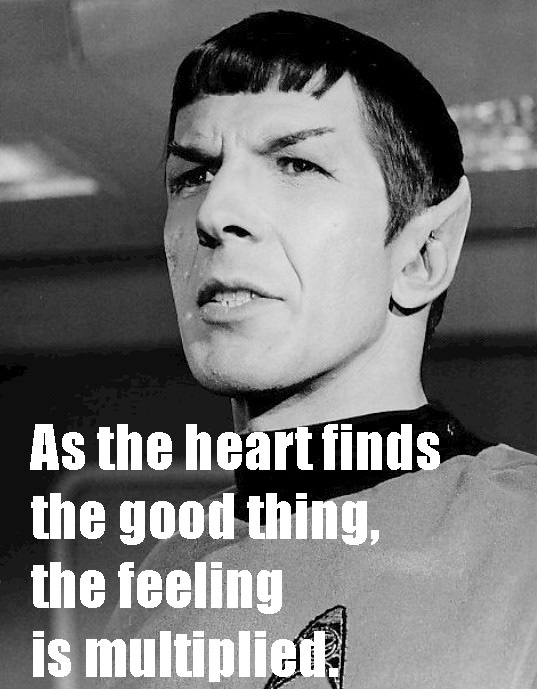 Spock was what made Trek compelling, and Leonard Nimoy was who made Spock compelling. 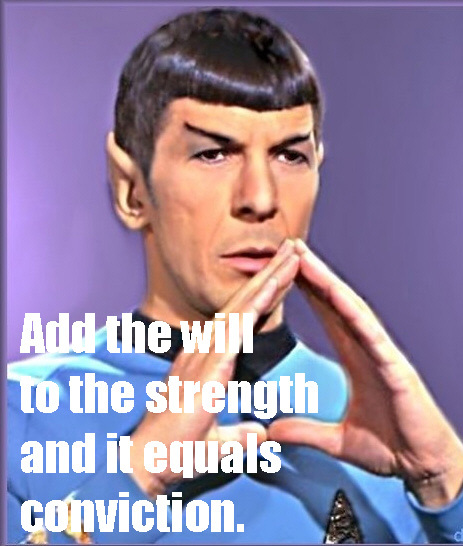 Nimoy not only invented Spock, but he invented Vulcans, and, indeed, he cast the template for how future, non-Vulcan fish-out-of-water characters would bring the same gravity to iterations of Trek. Seven of Nine is, essentially, a Vulcan. 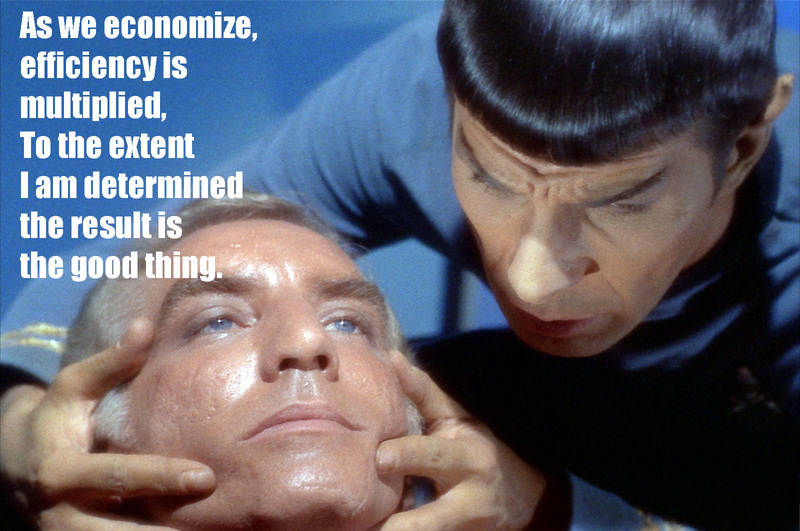 Data is, essentially, a Vulcan. Tuvok is, of course, a Vulcan, but without Nimoy’s clearly defined template, Tim Russ may not have played him so clearly. And, while these wannabes are all excellent characters, the originator was Leonard Nimoy, and it is due to his performance that we’re still talking about that show long after its three-season run on NBC. 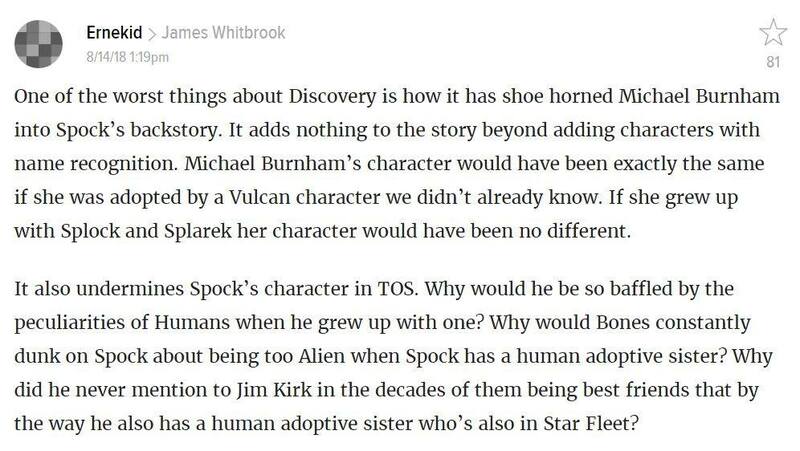 That, my friends, is why we’re getting a brand new Spock and why our first-season protagonist has a Bacon’s score with Spock of one. 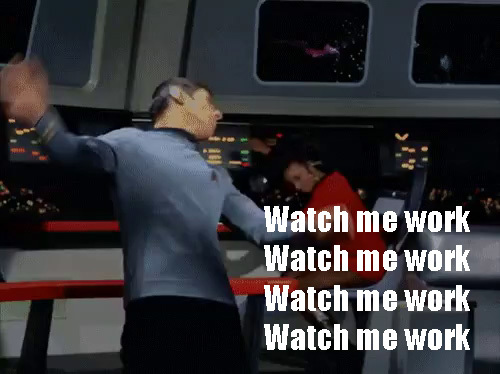 And now, some of my favorite Star Trek Shitposting items that I have done. Thank you. I suggest a flashback in Disco that confirms a gay relationship between Scotty and Bones.